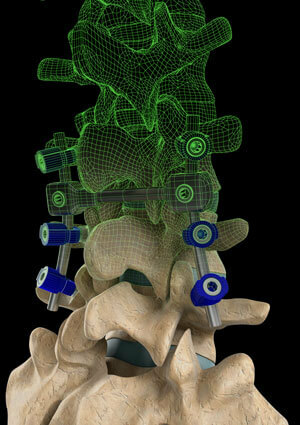 Many conditions or dysfunctions of the spine may ultimately require spinal surgery. In these cases, bed rest, medications, physical therapy, bracing or other medical options may not have been successful or perhaps the condition is too severe to respond to conservative treatment. The point is that you may have a student in your class who has had a significant intervention and alteration to their normal spinal mechanics. How should this be handled? What do you need to know? Of all spinal surgeries, fusions represent the most concern to a somatic educator due to the extensive alterations of spinal and movement mechanics involved. Let’s take a look at normal spinal movements to gain an understanding of the concern after a spinal fusion. Movement in a normal spine is the result of all of the individual articulations between the 24 vertebrae in the neck, mid, and low back plus the sacrum. The resultant movement potential in the spine is the sum of all of these individual parts. With a spinal fusion, at one or more levels, some of this movement potential is compromised or no longer available. The rest of the vertebrae then need to make up for the missing dominos or links in the chain. So rather than all vertebrae contributing equally to a given movement such as flexion, extension, rotation or side bending, the fused area functions as a solid unit offering movement only above and below the fused vertebral levels. The primary precaution and area of concern therefore, following a spinal fusion are the vertebral levels immediately above and below the fused area. If these vertebrae are overused or asked to contribute too extensively in movements the result can be a progression of the degenerative process in the spine or the need for further fusions if the demand is too intense. For information on the contributions somatic education can yield in individuals with spine surgery, see the addendum to this article. Ruthy Alon, the founder of Bones for Life® (BFL), has developed the idea of “proportional flexibility” of the spine and the entire body throughout her 90 BFL processes (exercises). Certain processes are highly effective at accessing and engaging the ribs and thoracic spine in innovative ways by setting up a specific bias or constraint elsewhere in the spine or body. In order for a little used area to move, the overused area needs to remain quiet. This invites the restricted region to participate in movements and activities and helps to reorganize an overuse pattern or habit of movement into a more optimal functional capacity. With spinal fusion, where the primary concern is guarding against excessive movement above and below the fused region, the concept of proportional flexibility becomes critically important. BFL is an excellent way to achieve uniform contribution from all available vertebral levels. This will help promote a positive surgical outcome with an improved sense of well-being for participants. The Feldenkrais Method consists of more than 1,000 “lessons” that can be done in a group setting ( Awareness through Movement® classes) or in one-on-one sessions ( Functional Integration® ), if the client requires more tailored attention through words and skilled movements/touch of a practitioner. The brilliance of Dr. Feldenkrais’ contribution to movement science is that each lesson, individually and all of them collectively, engages muscles and actions that are often unusual and seldom recruited in normal daily activities. Furthermore, the way in which movements are combined challenges and stimulates not only the neuromuscular mechanism and skeleton, but also the brain and emotions in new and evocative ways. This stimulation results in an expansion of possibilities and capacities that would not emerge if the person did not experience this unique method of somatic learning. If a person has had a surgical intervention such as spinal fusion in one or more areas of the spine, the tendency is to contract against movement during the initial trauma or injury as well as during the surgical healing process. This contraction may be local but can also more global if there is the usual fascial or connective tissue involvement. In these cases, Functional Integration may be of particular help. Beyond the protective contraction, the old movement patterns that may have been a contributor to the need for the surgery, will still be intact. With the addition of the Feldenkrais Method , the limitation or residual discomfort secondary to surgery diminishes and the final outcome or potential progress is significantly enhanced. Beyond the recovery from surgery, the patterns of self-use can be enhanced to decrease the ongoing likelihood of recurrence of injury or even further surgery. Denise Deig is the author of Positional Release: from a dynamics systems perspective. A Physical Therapist, Certified Feldenkrais Practitionercm Guild and Bones for Life® Teacher/Trainer. She has a private practice in Fishers, Indiana. You can find out more about her and her practice at www.denisedeig.com. Deig can be reached by email at denisedeig@comcast.net. She offers certification and continuing education programs through www.integrativelearningcenter.org.